Home > 0: Star Wars 7×7 Origins! 0: Star Wars 7×7 Origins! What’s with all the 7s? Glad you asked. I’m Allen Voivod, and this is the story of how Star Wars 7×7 came to be, as well as my own personal history with Star Wars. And it’s in much less than seven minutes, because you and I have other cool things to check out. Today’s the birthday of Rohan Nichol. Sounds like a Star Wars name already, yes? If you don’t know him, you can be forgiven, I didn’t until a few hours ago. He played young Captain (Raymus) Antilles in Revenge of the Sith. No relation to Wedge, it turns out. “Antilles” is like “Smith” or “Jones” in the Star Wars universe. Who knew? 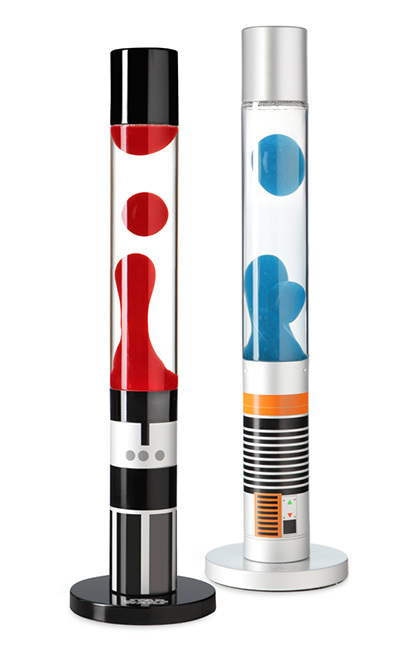 Star Wars Lightsaber Lava Lamps – click the pic! Starting out with softballs this week. Today’s question: Who did the Emperor refer to when he told Vader, “We have a new enemy”? So, what’s the deal with Star Wars 7×7? Well, all the sevens were impossible to ignore. But before I explain that, let me introduce myself. I’m Allen Voivod, your host and the creator of Star Wars 7×7. I’ve been a Star Wars fan for as long as I can remember, and if I had to put myself on a 1-10 scale of fan obsessiveness, I’d give myself, you guessed it, a seven. I’m not a collector – I sold most of my vintage Star Wars toys to pay for my wedding reception – but I love the ones I’ve kept. My trivia knowledge is getting rustier as the years go on, and as the Star Wars universe gets filled out more broadly and deeply with each passing year. I’m psyched to be able to share the movies with my two sons, now 11 and 6. I prefer the original trilogy but I’m not a prequel trilogy hater; I abhor the Special Editions; and if I’m anywhere and hear a slice of John Williams’ music, or even the 20th Century Fox fanfare, I’ll stop what I’m doing to find out where it’s coming from. It’s like an involuntary response. Let’s talk about the big one: Star Wars 7, coming out December 18th, 2015. Back in the 70s and 80s, Lucas said there would be a third trilogy (and even three more standalone movies besides! ), and since then, he’s been denying it. First that it would be too much work, and then that he didn’t have as much of it laid out as it had sounded like, and eventually that there wasn’t really anything planned at all. But you and I knew better, didn’t we? We knew it was just a matter of time. And even better – it’s in the hands of a new and talented generation of storytellers, with some of the best mentors possible. Another set of sevens: I saw Star Wars in 1977, the year I turned 7. Oh, she took me to other space movies when I was a kid – Blade Runner and Outland among them. But Star Wars stuck in a way that nothing else did or could. I’m sure the toys had something to do with it, too…maybe if I’d had a Sean Connery action figure as Federal Marshal O’Neil from Outland, things would be different! I subscribe to a few different Star Wars podcasts, most of which are an hour or more long, and most which come out weekly at best. I’ve been craving something shorter, and then I thought, heck, why don’t I do it, then? I’m also a part of Chris Brogan’s Owner Mastery Foundation Group, which includes daily motivational emails on various business supportive themes. And usually, each week is a new theme, with 7 emails per theme. See the sevens coming together? So when it came time to plan for the launch, the date 7/7/14 was shining pretty bright on the calendar. Again, the sevens were too much to ignore. So here we are, fellow Star Wars fan! Let’s spend 7 minutes together and revel in the awesomeness of Star Wars. Previous Post: Subscribe for a Free Daily Dose of Star Wars Joy!